In Shropshire we put high quality patient care at the centre of everything we do. This is an exciting time to join our MSK OPD team at The Princess Royal Hospital, Telford. You will be working alongside our MSK Clinical Coordinator and new Therapy Outpatient Centre Manager and Head of Profession (OPD) in setting a new direction for our services alongside the Therapy Quality Improvement Lead (TQILs). 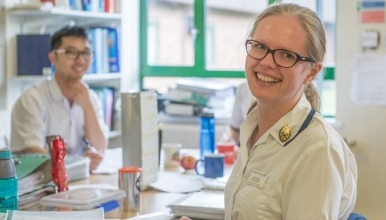 Are you a Musculoskeletal Physiotherapist with a passion for delivering high quality, contemporary patient care and would like to be a part of a dynamic MSK team within Shropshire? Due to promotion of a staff member we have the opportunity for a Specialist Musculoskeletal Physiotherapist to join our team here at The Princess Royal Hospital in Telford, where there are extensive facilities available to support patient care. As a specialised physiotherapist you will be integral to leading and delivering MSK services at The Shrewsbury and Telford Hospital NHS Trust. You will have a varied caseload of both consultant and GP referrals consisting of upper, lower limb and spinal conditions with the opportunity to gain experience in hydrotherapy, OPD MSK clinics, Hand Therapy and outreach to the Community. We have a team of experienced Physiotherapists and Occupational Therapists and Advanced Practice Physiotherapists in A and E, Fracture clinic and Orthopaedic clinics who are integral to the team. The department is involved in research projects and has close links with HEI's providing clinical placements and working closely to identify opportunities for staff. We are committed to allocated CPD time, clinical outcomes and providing a responsive patient focused service. You will also contribute to the outpatient physiotherapy weekend and bank holiday rota. Demonstration of Trust values will be confirmed by interview, which will include values based scenarios in addition to clinical questions.